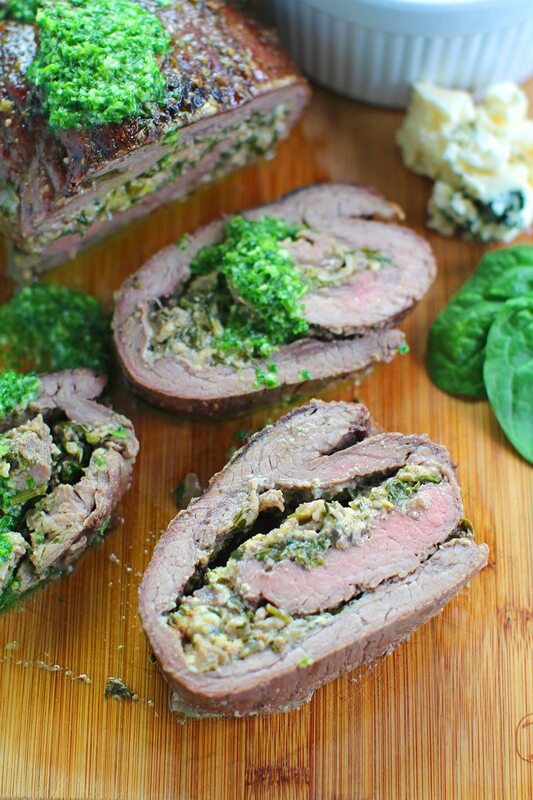 Stuffed Flank Steak with Spinach and Blue Cheese is packed with garlic, caramelized onions and walnuts. 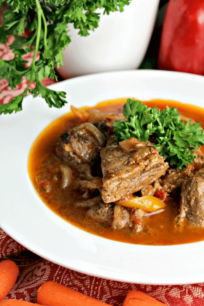 A very easy dish that is packed with flavor! I love making quality beef meals for the family to enjoy. 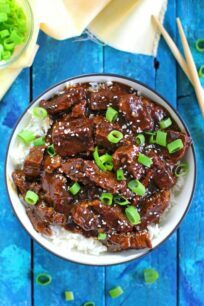 Among our popular beef recipes are Instant Pot Mongolian Beef, French Dip Sandwiches, and Asian Short Ribs. 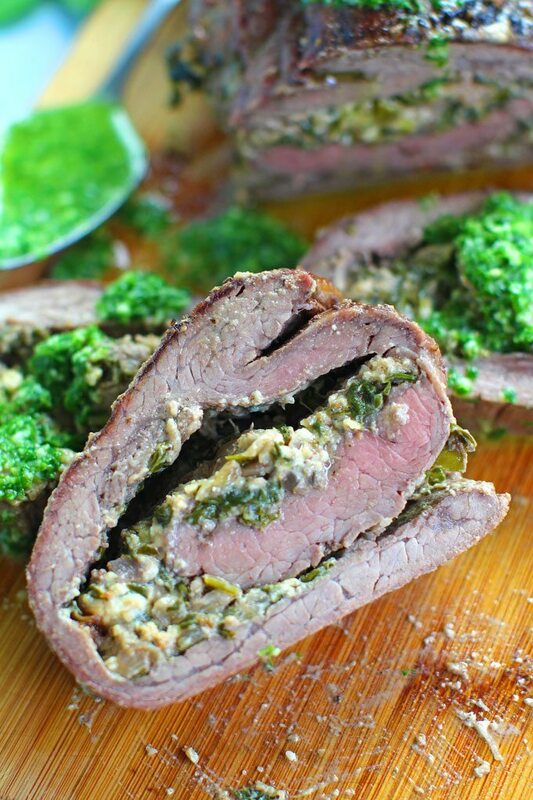 Stuffed Flank Steak is my new go to dinner because it is very easy to make and has endless flavor combos! Spinach Blue Cheese Stuffed Flank Steak is the latest combo we have tried and my whole family fell in love with it. The flank steak is stuffed with a mixture of caramelized onions, lots of minced garlic, spinach and blue cheese. 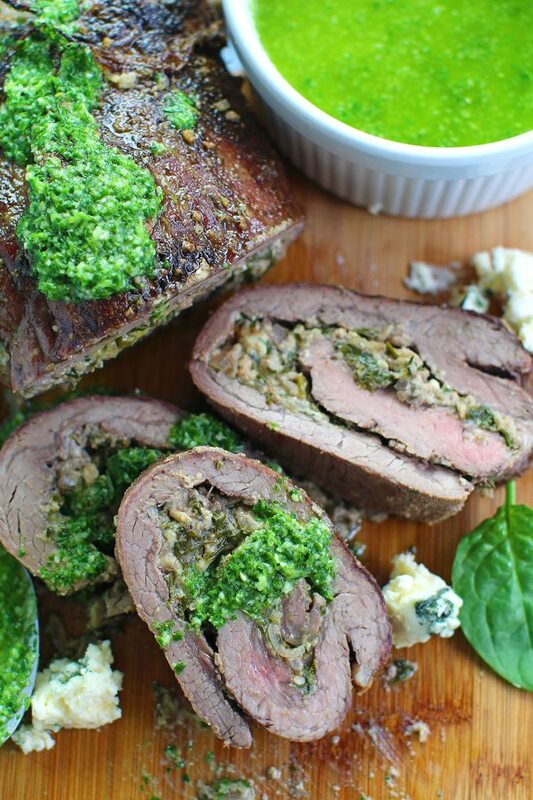 After being cooked to juicy perfection, the stuffed flank steak is served with a refreshing Chimichurri Sauce. This will balance the rich blue cheese flavor. 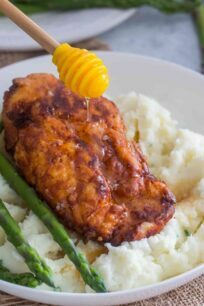 This easy to make meal involves minimum prep work while producing a great dinner that can be served on special occasions or busy weeknights! Why Use a Flank Steak for this recipe? The flank is a single, boneless, thin piece of muscle located behind the rib cage, beneath the loin, and in front of the rear legs. It usually weights between one/two pounds. 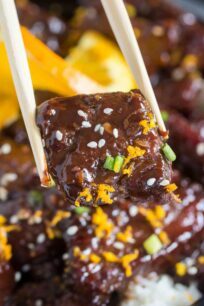 Because this cut of meat is thin, it takes very well to marinades, making it tender and flavorful and it’s also very easy to roll. 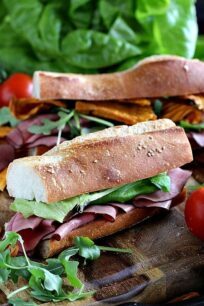 Use quality meat, preferably organic beef, because the meat will be tastier and juicier. When buying a flank steak, choose one that is as uniform in thickness as possible. It is OK for it to be thicker in the center than at the ends. This recipe works best with 2-pound flank steak as you need to butterfly it in half. Hence, the thickness of the steak is important. You can also ask your butcher to butterfly it for you. Flank steaks taste best when cooked to medium rare or medium. I have family members that don’t like medium-rare meat, so I tend to cook it medium, with a light pink center. If you overcook it, the steak will become tough and tasteless. The recipe asks for a lot of garlic, what can I do, we love garlic in my family! You can use less or more, based on your own preference. 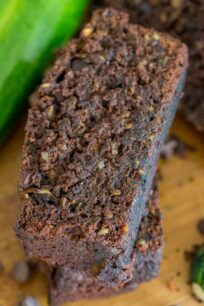 The ground walnuts are a very nice addition, their nutty flavor compliments well the blue cheese, if you don’t have any on hand, you can skip them. Can I stuff the steak with other cheeses? Blue Cheese is amazing in this recipe, BUT if you are not a fan, you can replace it with Feta Cheese or Goat Cheese. 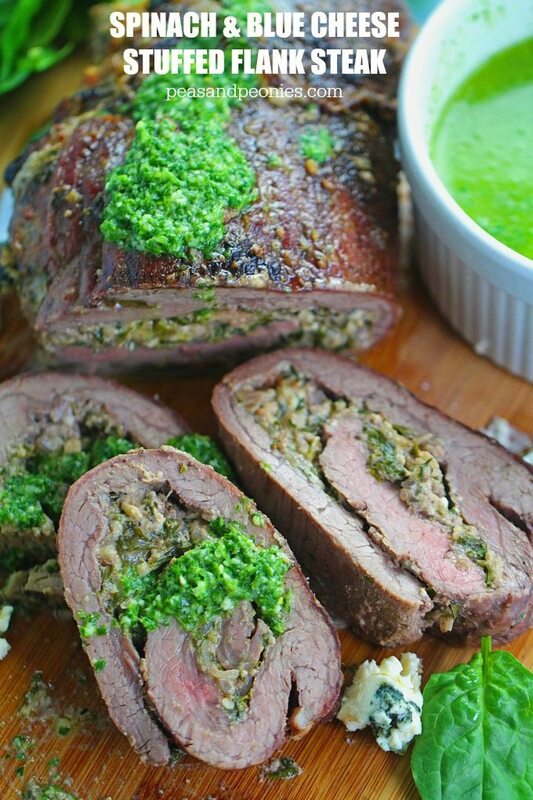 Also, you can use mozzarella cheese for this Stuffed Flank Steak recipe. 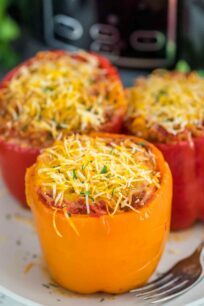 Flavorful and juicy, always a winner at the dinner table! Pre-heat the oven to 425. Butterfly the steak, look for it to be between ¼”-1/2” thick. Place it on a cutting board. If you spot parts that are unevenly thick, flatten them out with a meat mallet. Season the steak with salt and pepper and set aside. Place a medium-large skillet over medium heat. Add 1 tablespoon of olive oil, once the oil is hot add the chopped onion and minced garlic. Cook for 3-4 minutes, stirring occasionally, until the onion is soft and starts to turn golden brown at the edges. Add chopped spinach to the skillet and cook for 3-4 minutes, stirring occasionally, until the spinach is soft. Set aside to cool off. In a large mixing bowl, combine ground walnuts, crumbled blue cheese and the spinach mixture. Stir well to combine. Season with salt and pepper to taste. Turn the steak so the “grain” of the steak is running left to right in front of you. Spread the spinach mixture evenly across the surface of the butterflied steak, one inch away from the sides of the steak. Starting with the side closest to you, roll the steak tightly forward, around the filling, until the roll is complete. Use twine to tie up the rolled steak about every 2 inches. If you see any filling escaping out the sides, tuck it back in. Add 1 tablespoon of olive oil to a 9×13 baking dish, brush the sides and bottom of the dish with the oil. Transfer the stuffed steak roll to the baking dish and using a pastry brush, brush the remaining 1 tablespoon of olive oil all over the surface of the steak. Sprinkle with the remaining 1 tablespoon of black pepper. Place in the pre-heated oven and bake for 35 minutes. Turn the oven to broil and broil for 5-10 minutes. Watch it closely not to burn it. Remove from the oven, cover the steak with aluminum foil and allow the steak to rest for 15 minutes before removing the twine and slicing. Cut into slices with a serrated knife and serve. In a food processor, combine the parsley, cilantro, red wine vinegar, garlic, oregano and crushed red pepper. Process until smooth. Season with salt and pepper. Transfer the sauce to a bowl and pour the olive oil over the mixture. Let stand for at least 20 minutes. Stir and drizzle over meat. *35 minutes of baking + broil time, will cook the steak to a pinky medium in the center, if you want yours to be cooked further you can add a few minutes. Don't add too much time as the steak also will continue cooking while it rests. *When you buy the steak, you can ask your butcher for twine. Oh my goodness, that is positively drool-worthy, YUM! Thanks so much for these tips! I’m so excited to try this! Looks really good! Omggggg this looks so flavorful! 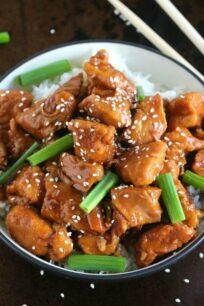 Pinning for later! We’ve never stuffed a steak like this before, but after reading this, I cannot wait to give it a try! That looks just incredible!! 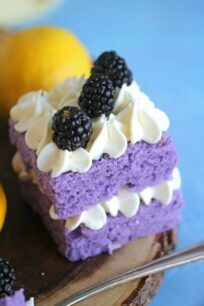 Need to make this ASAP!